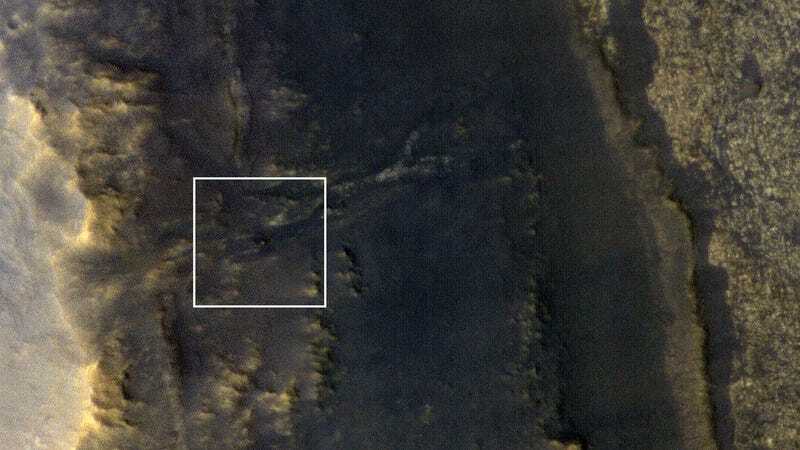 The Opportunity rover is the tiny white dot in the center of the white square. It’s been 107 agonizing days since NASA last heard from Opportunity, raising fears that the 14-year-old rover has finally expired after being battered by a massive dust storm. The Martian probe may be quiet, but a new photo taken of Opportunity from space is providing some much-needed solace. If you look carefully, you can see a tiny white dot in the center of the white square. That’s Opportunity. The photo was taken on September 20, 2018, by the HiRISE camera aboard NASA’s Mars Reconnaissance Orbiter (MRO). The satellite was just over 165 miles (267 kilometers) above the surface when it took this shot. The square highlighting Opportunity is just over a half-mile across. So there it is, the hibernating Martian probe. The photo doesn’t tell us much, other than the fact that the rover isn’t completely buried under dust. Actually, the relatively clear view of Opportunity is a sure sign that the global dust storm, which peaked in June, is truly dissipating. A zoomed-in view of Opportunity. At one point, the dust storm extended across the entire circumference of Mars, making it a truly global event. In the area where Opportunity was working, Perseverance Valley, the dust blocked sunlight from reaching the surface, which was bad news for the solar-powered probe. Opportunity had no choice but to put itself into hibernation mode, in hopes of preserving enough energy for a reboot once conditions improved. Sadly, and quite alarming, Opportunity has stayed quiet despite the waning storm. The tau—a measurement of how much sunlight reaches the surface—over Opportunity was estimated to be a little higher than 10 during some points during the dust storm. The tau has steadily fallen in the last several months. On Thursday, Sept. 20, when this image was taken, tau was estimated to be about 1.3 by MRO’s Mars Color Imager camera. At this point, there isn’t much more that NASA can do but continue to ping the probe and wait. Sad as its demise would be, however, Opportunity has endured 60 times longer than expected. If the rover is truly dead, it would represent the end of a wildly successful mission. Correction 7pm, 10/14/18: A previous version of this article incorrectly stated that NASA put Opportunity into hibernation mode. NASA clarified to Gizmodo that it believes the rover put itself into hibernation mode. We regret the error.